★This adaptable set of six 1/35 scale figures is perfect for use with Tamiya WWII U.S. tank models such as the M4A3E8 Sherman "Easy Eight" (European Theater). 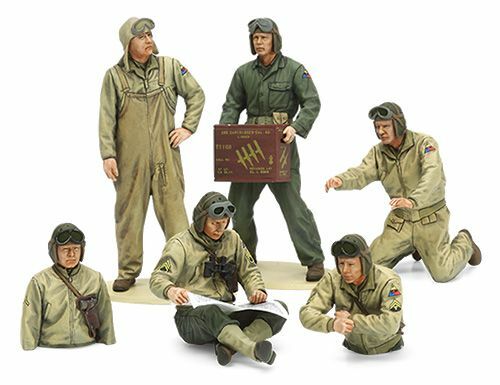 ★Figures feature highly realistic poses and depict soldiers in uniform typically used in the European Theater of WWII. ★The set includes 3 types of clear goggle parts (2 of each). 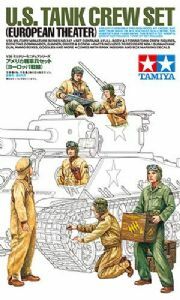 ★Parts are included to authentically recreate accessories such as M3A1 submachine gun and 2 different types of ammunition box. ★Comes with decals depicting unit and rank insignia. ★Set contains 4 full body figures and 2 torso figures. U.S. tank crew in WWII used a uniform essentially the same as their infantry counterparts, although a tanker's helmet and warm tanker's jacket with fitted sleeves were designed to be used by crews in their cramped vehicle interiors. Goggles were a vital form of protection from dust, and many tank crew also used hoods and overall-style tanker's trousers to keep the cold at bay.